Water. It’s the original renewable resource – and a good job, too, because there isn’t any more, anywhere, ever. So all we can do is try to manage it this way and that so that each of us gets as much as we need. Sounds simple, but ours is a big and varied planet and climate is capricious stuff, so while some of us are swimming in it – willingly or otherwise, there’s always someone else gasping for a precious drop. 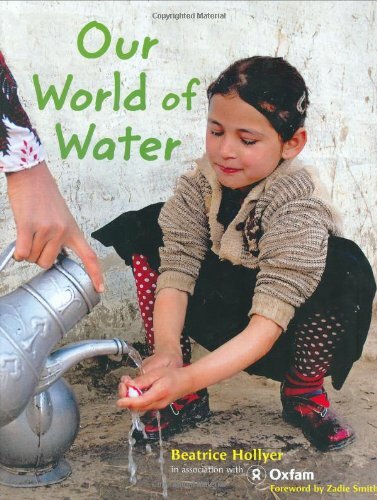 Hollyer’s book shows us these extremes by visiting different parts of the world and observing differential approaches to and uses of water in them. So we find that in upland Peru accelerated glacier-melt diminishes domestic water supply, in coastal Mauritania it hardly ever rains and water’s very precious while coastal Los Angeles – not much better – has piped water for dishwashers, jacuzzis and cleaning the car. Bangladesh is often awash with flood but clean drinking water must come from deep-sunk tube wells, while in Ethiopia a herdsman’s family can spend up to ten hours a day taking its beasts to and from the nearest water-hole. These excellently described examples are illustrated by a dedicated team of photographers recording the daily doings of one family in each place, so the integration of text and pictures is in all cases absolute and the quality of each is top class. Result – an excellently readable and easily understood primer of water-value and water-use around the globe; messages about water stewardship emerge of their own accord, the only preaching coming in Zadie Smith’s foreword. A thoroughly informative, enjoyable and worthwhile addition to any thoughtful collection.